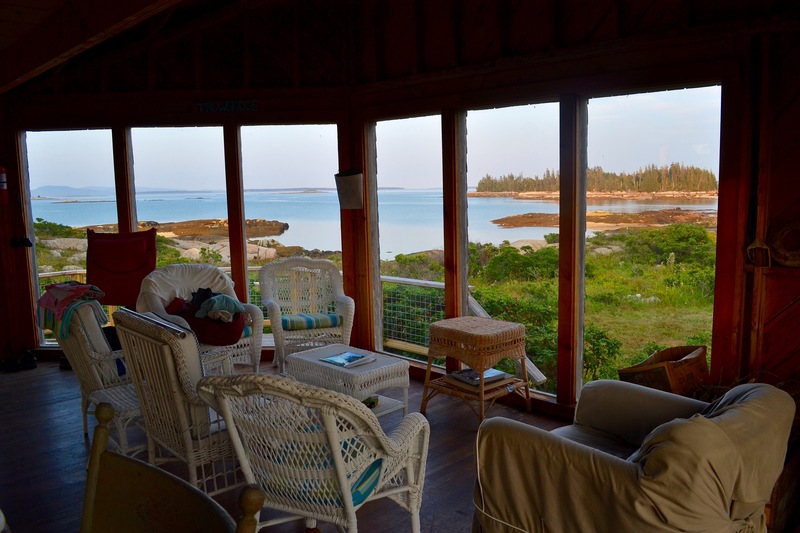 We are right at home in a rustic cottage on a tiny privately owned island, Little Lazygut, just off of Deer Isle on the Maine coast. At high tide, Little Lazygut is only about 300 yards wide, but there are nice beaches all around and it’s been all ours for the past few nights (cottage renters only here, kind of nice). 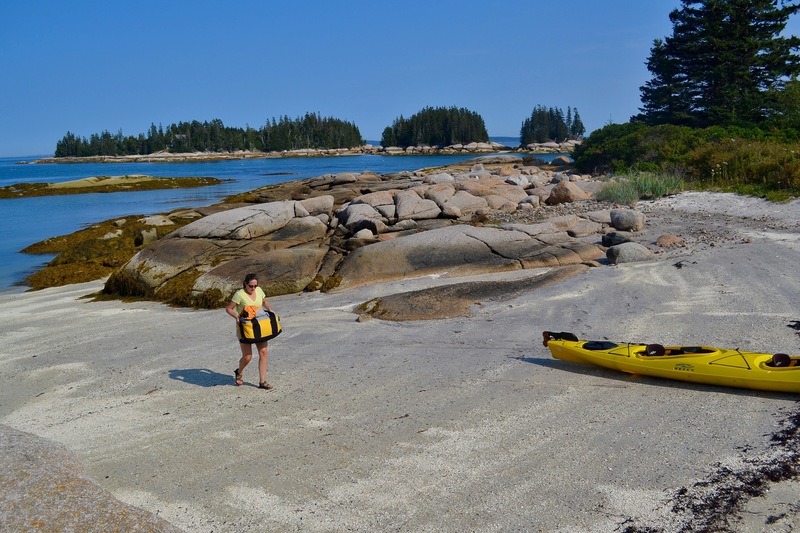 We came over from nearby Stonington by boat shuttle and brought a tandem kayak along, which has been great for exploring nearby islands and coves. 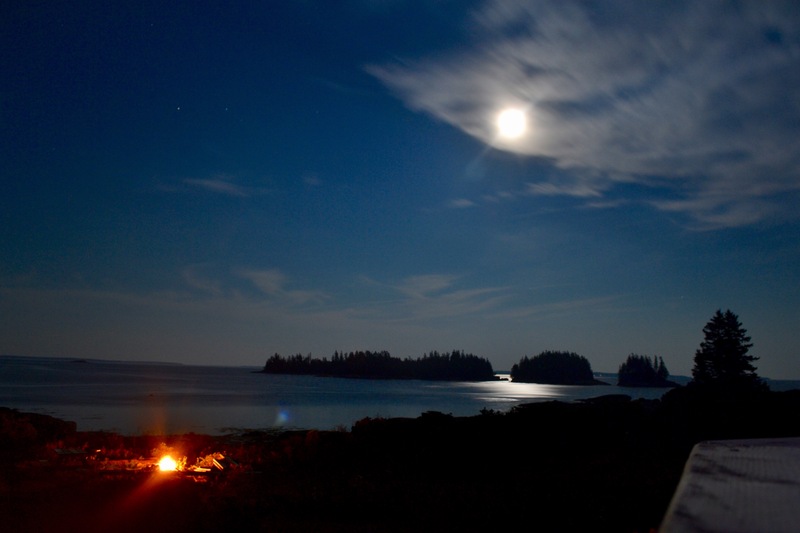 We’ve had killer sunsets, a full moon, outdoor fires, and lots of wildlife (birds, deer, even a mink). As for the cottage, there’s no electricity or running water, but there’s a propane powered fridge, stove, and oven, which has been the ticket to some great meals. And now that we are on day three, the name Lazygut seems to fit. 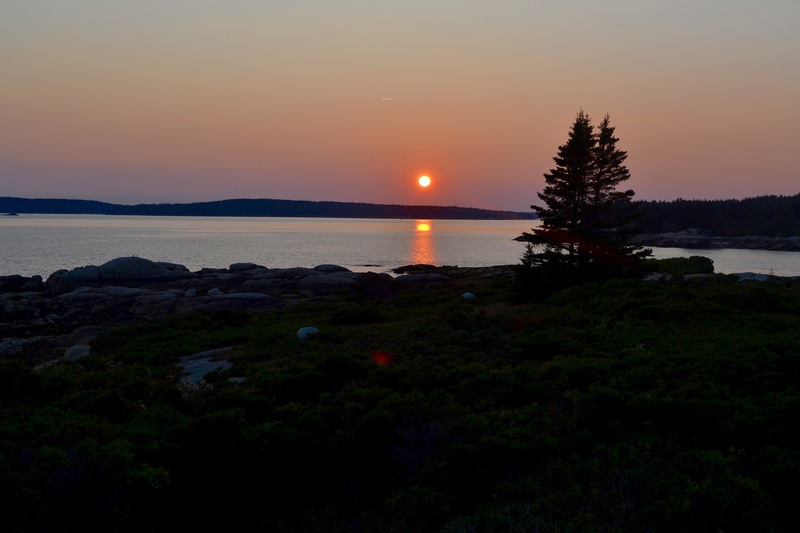 Mainers seem to have their own vocabulary, and we are starting to catch on a bit. And in addition to learning some new expressions, we are also learning a bit about old expressions. For instance, the saying “happy as a clam” is actually abbreviated. It’s really supposed to be “happy as a clam at high tide.” And now I know why. 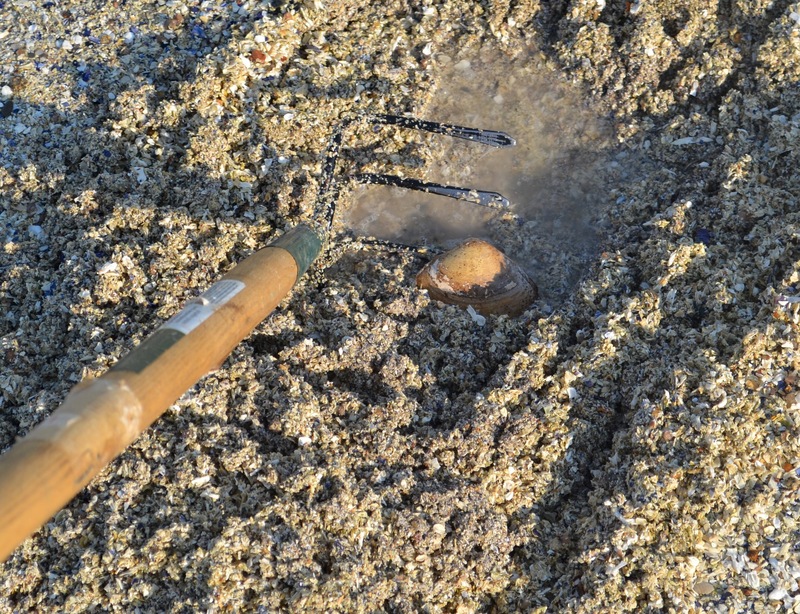 Clamming is most certainly a low tide affair, which was at 6:30pm yesterday. Just 50 yards from our front porch, there’s a long sandy beach that was just perfect. Basically you look for air holes or squirts of water and then dig down six inches or so with a clamming rake (we brought a garden rake along and it worked just fine). 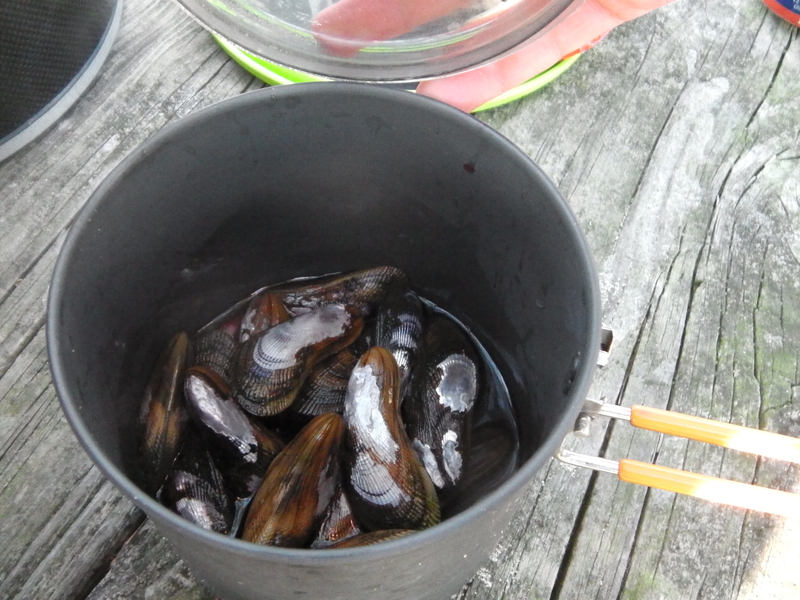 We had a half dozen clams in less than 20 minutes and set our sites on dinner. 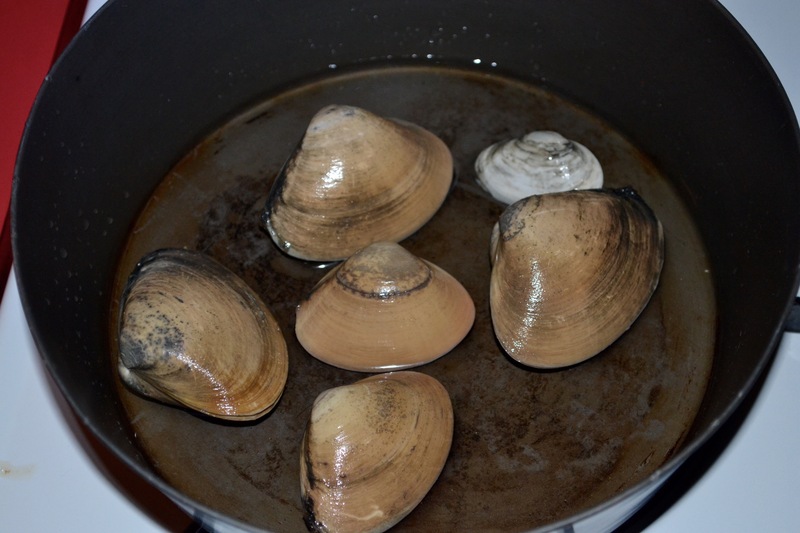 To clean up the clams, you scrub the shells and then soak them in salt water with a bit of corn meal (the clams eat the corn meal, which helps rid them of sand). Another 30 minutes of prep and we were looking at the freshest of appetizers, clams casino. 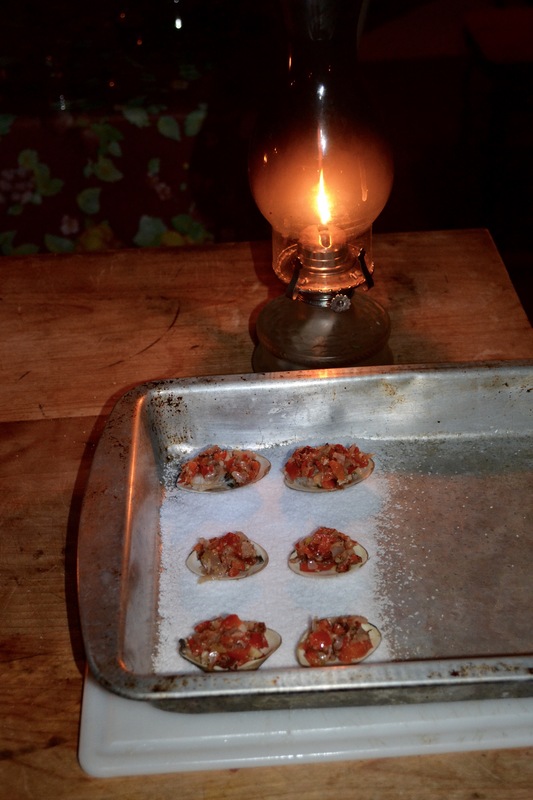 Clams casino is an old fashioned recipe (think 1970s dinner parties) that comes in a lot of variations, and there’s a reason it’s still around. We used shallots, red bell pepper, garlic, oregano, olive oil, and pancetta. It’s a bit of effort to shell the raw clams, but this is an excellent dish and in particular was good using a fresh catch. One taste of these and we were happy as clams (at low tide). This past weekend we took a little overnight sea kayak camping trip out at Assateague National Seashore. Gusty winds to 25 mph took a little wind out of our sails, but it was perfect prep for a trip further afield that we are planning later this summer—and we’d do it again in a heartbeat. 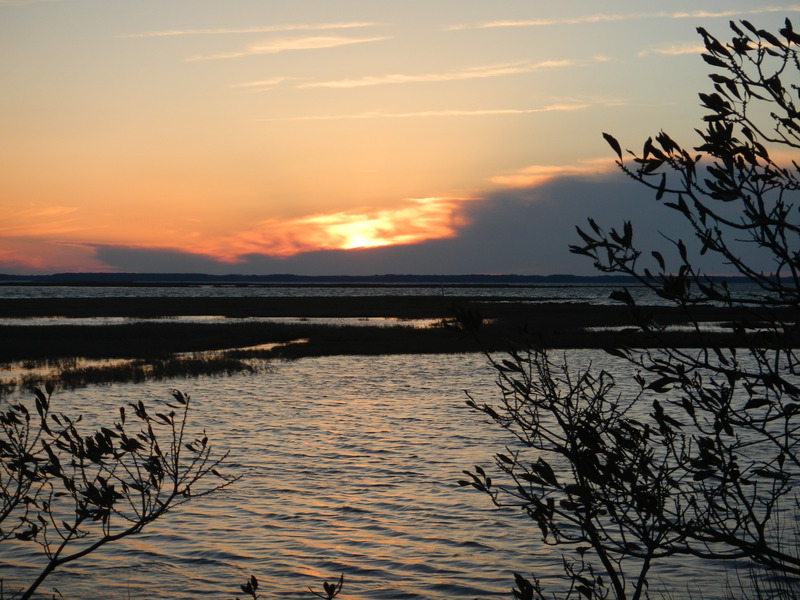 Assateague is bug-free and beautiful this time of year, with wild horses cruising through camp at full gallop (no kidding) and a sunset that seems to last a full hour. We are new to sea kayaking, but we learned a lot on our maiden voyage. For further practice for our summer trip, we cooked pretty light, but we happened into a lovely surprise appetizer. 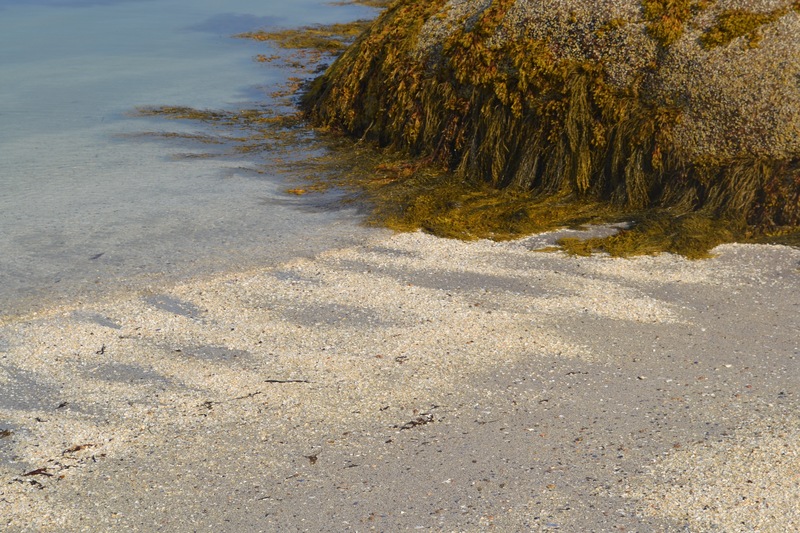 As the tide went out on the bay side, we did, too, and we discovered that the shoreline was teeming with mussels—just what our team needed, and an unexpected windfall. 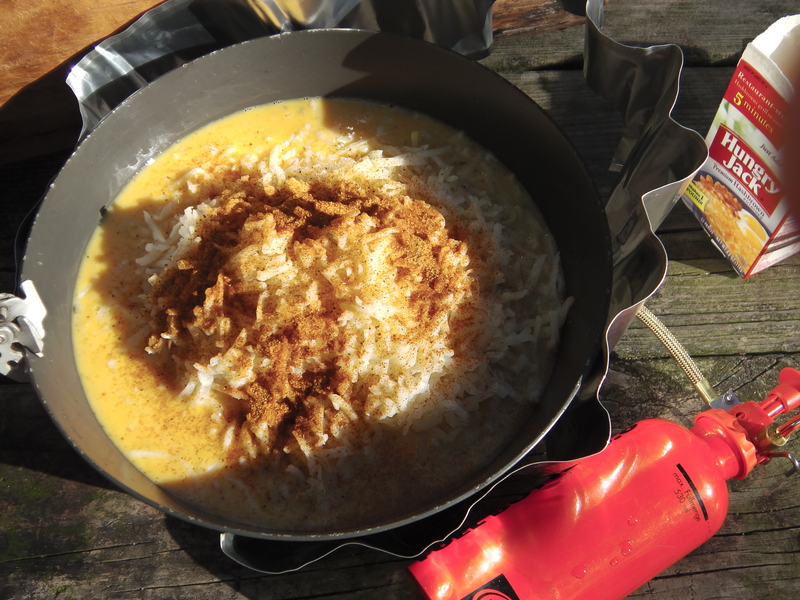 When the backcountry kitchen isn’t about planning, it’s about ingenuity. With that in mind, sand substituted for a cleaning brush, a nesting pot substituted for a steamer, and red wine filled in for white wine. In the end, the mussels came out perfectly. 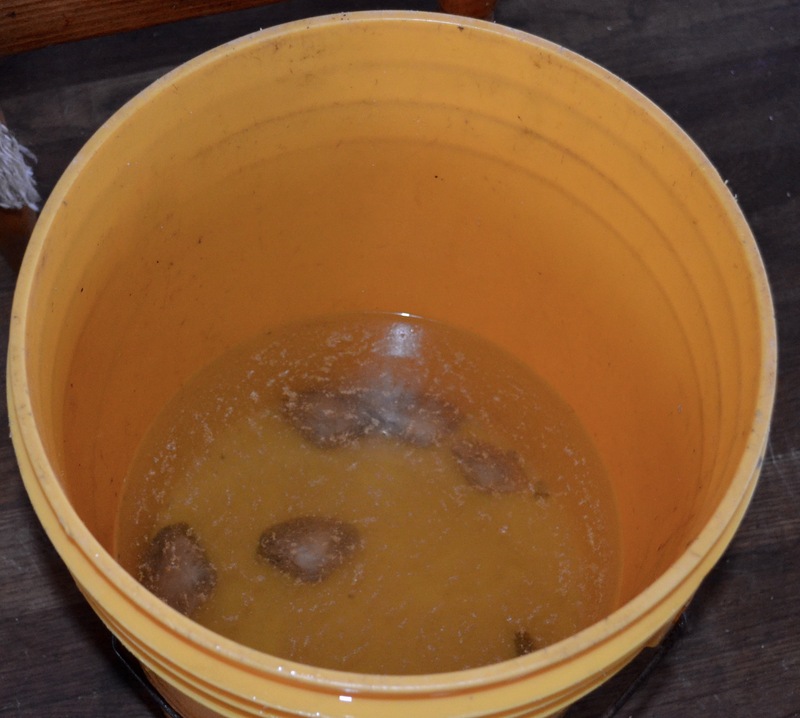 Prep was easy, and a big key was soaking them in fresh water for about 20 minutes to allow them to breathe out built-up sand. We also had to “de-beard” a few of them–a new term for me that triggered an endless stream of bad puns, but a task that was easily done by hand. It was twenty minutes from ocean to table, and it was a delightful little warm-up to our unremarkable boil-in-bag dinners. While mussels were the only delicacy of the weekend, we did experiment a bit on Sunday morning with a new breakfast dish made with dehydrated hash browns and “no refrigerate” bacon that we named Old Bayside Quiche, inspired by the Old Bay seasoning that we sprinkled liberally while cooking. Mixing up fresh eggs ahead of time at home and then freezing them in a ziplock bag was just the trick. While not exactly a new concept, the egg mixture works well and the resulting baggie is way less bulky than those plastic egg carrier thingies. It does make you look weird(er) when you do the prep before a dinner party at a friend’s house in Annapolis the night before—but at least I shaved beforehand, which is more than I can say about those mussels.